Take Interstate 93 to exit 25. Make a right at the bottom of the ramp. Follow Holderness Road to the traffic circle. Go 3/4 the way around the circle and exit onto Main Street (Route 3). Continue past the Common and turn left to head north on Main Street. 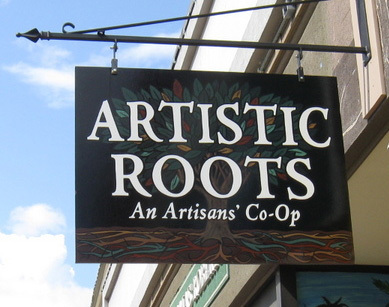 Artistic Roots is on the right, between Frame of Mind Art Studio & Framing and Rand's Hardware. Follow Rt. 25 to Plymouth Exit. Turn right at end of ramp, 3/4 mile to roundabout. Through roundabout to Main Street (Route 3). Continue past the Common and turn left to head north on Main Street. Artistic Roots is on the right, between Frame of Mind Art Studio & Framing and Rand's Hardware. Please consult the parking map for suggested parking possibilities.